Spray 12-inch nonstick skillet with cooking spray; heat over medium-high heat. Add chicken; stir-fry 2 to 3 minutes or until brown. Stir in broth; heat to boiling. Stir in pasta and bell pepper. Heat to boiling; reduce heat to medium. Cover and cook 10 minutes, stirring occasionally. Stir in tomatoes, wine and tomato paste. Cook uncovered 5 to 10 minutes, stirring occasionally, until chicken is no longer pink in center and pasta is tender. Sir in olives. If you like your sauce a little thicker, start with 1 tablespoon of tomato paste and then add an additional tablespoon. 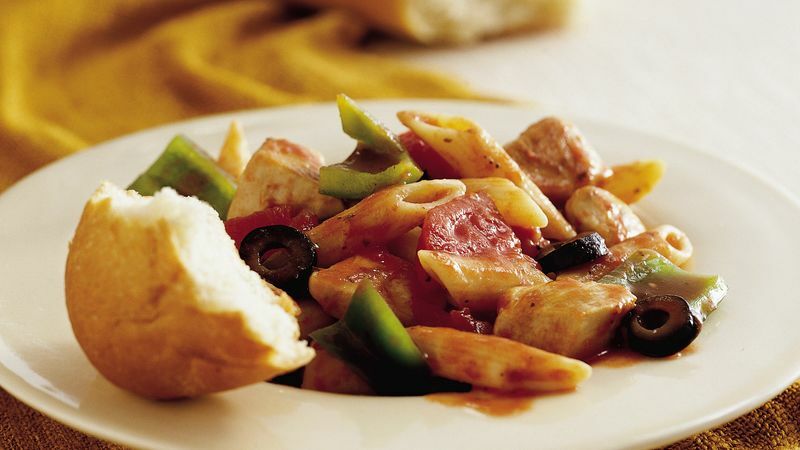 Thought to be created by Napoleon's chef after the Battle of Marengo fought in 1800, this famous dish combines chicken with tomatoes, olives and white wine. In this version, pasta is cooked right in the sauce for an easy one-dish meal.